Bullets have to "stop" somewhere, explained the PSNI's Mark Hamilton, pondering on how a gunman could randomly open fire in a crowded suburban street. 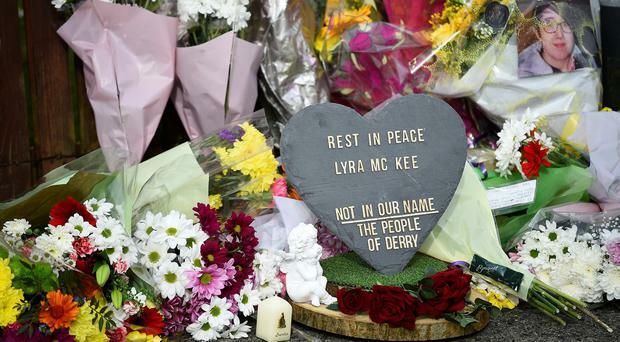 The tragedy was that when they "stopped" so too did the rich life of gifted journalist Lyra McKee. Today one of the most powerful women in the world will visit Stormont to honour the Good Friday Agreement. Hearts sank a little as the first images of orange flames licking over the roof of Notre-Dame emerged. There is not a playwright living or dead who could have devised a drama to incite as much fury, exhaustion and resignation as Brexit. Classic comedy fans are now running out of analogies to draw with Brexit. It says much about the downfall of Theresa May that the only real power she now has is to leverage her own resignation as an inducement to vote. Diverted by the din in London, it's time to wake up to the creeping cataclysm of a no-deal Brexit. Sometimes an event comes along of sufficient evil to cast a shadow over the whole world. With disappointment, relief but mostly dignity, families of victims of the 1972 Bloody Sunday killings reacted to the news that only one former British soldier would be charged. Words are supposed to have power, wise ones survive after those who have spoken them have moved on. Podiums had been polished and sound-checks completed, but once again the preparations for a planned read-out on progress on Brexit had to be cancelled in Brussels. No progress, no discussion. Many of the great social changes occur without our noticing. By the time they are identified as trends by either sociologists, or economists, someone has either won or lost, and the rest is academic. The Taoiseach is right to insist that Ireland has been "very flexible and reasonable" in helping the UK to deal with problems "largely of their own creation" on Brexit. If happiness is not the absence of problems but the ability to deal with them, Housing Minister Eoghan Murphy may not be in the best of form just now.